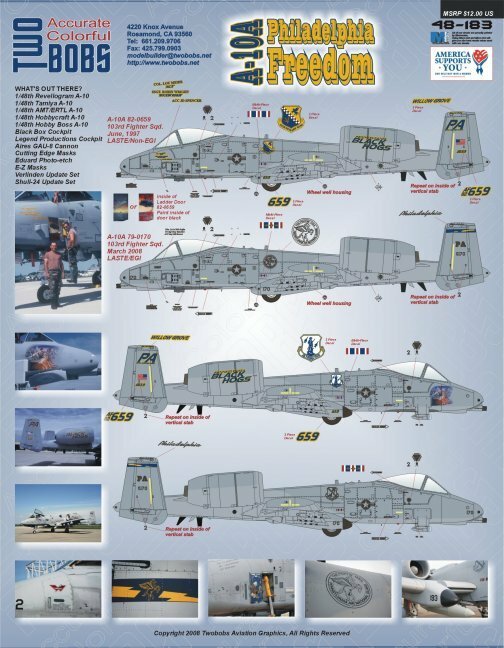 TwoBobs 48-183: 'A-10A Philadelphia Freedom". Escala 1/48. [This sheet covers a very wide time span of the 103rd FS from the Pennsylvania ANG, 1997-2008. There are enough markings on this sheet for two complete aircraft with enough options for eight different aircraft. The signature aircraft is the "Black Hogs" jet from 1997. Nose art for Black Hog along with ladder door art for all the aircraft are printed in four-color process in order to capture all the gradient fills of this elaborate artwork. Sized for the Monogram, Hobby Boss and Italeri kit. Aircraft specific details are annotated on the instruction sheet]. Recommended Kits: •Revellogram A-10A •Tamiya A-10A •AMT/ERTL A-10A •Hobbycraft A-10A •Hobby Boss A-10A •Italeri A-10A. Este produto foi adicionado em nosso catálogo em quinta 04 agosto, 2011.